Life is tough and it doesn’t always feel like we’re doing all that well. But most of the time, we are actually doing considerably better than we think we are. Stop being so hard on yourself. 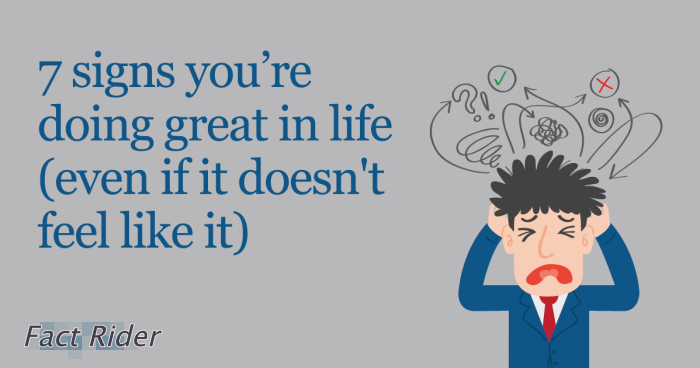 These are 7 signs you’re doing great! 1. You’re here, aren’t you? Being alive is the first indicator that you’re doing alright. The odds weren’t that great that you’d be born in the first place and the world is a chaotic, volatile place. The odds aren’t always that good. 2. You haven’t let go of your dreams. It may seem like you’re a failure when you strive for your dreams but can’t seem to reach them. That doesn’t mean things aren’t going well for you. You’ve lost your dreams when you no longer dream them. As long as you have your hopes in your heart, you’re on the right track. When we fall short, we feel miserable. That’s pretty normal. If we seem to consistently fall short, it can feel like we’re failing all together. As long as you’re working hard and always improving, you’re in a good position. Even if it’s your mom. And hey, while we’re on the subject, call your mother. Life can feel like you’re constantly being hurt, one after another. It may seem like they leave your life in shambles, but as long as you’re able to forgive them, you’re in a way better place than you think. 6. You have a roof over your head and clothes on your back. Tonight, nearly a billion people will go to bed hungry. More than 150 million will be children. 3 billion people won’t have access to adequate housing. Almost a billion won’t have access to clean water and 2.5 billion don’t have access to adequate sanitation. I’m not one to be a bright sider, but chances are, if you’re reading this, you’re in a better place than many. Instead of worrying about your own position, volunteer to make the world a better place. 7. If you can be yourself. There are many who hide away the people you are. If you’re out loud and proud being yourself, you’re in a great place. Don't Forget To Share This Post With Everyone !